Hair loss is a very common problem in Manchester these days; however, they differ from individual to individual. While some suffers from balding, some from hair thinning therefore, to treat this problem PRP therapy is a good option. In London people who are suffering from hair loss issues can find many reputed clinics that enable them to deal with the problem with the help of non-surgical treatments such as PRP therapy. PRP stands for Platelet Rich Plasma that is concentrated blood plasma containing about three to five times the number of platelets found in blood. Apart from it, it also contains VEGF (vascular endothelial growth factor), PDGF (platelet derived growth Factor), TGF (transforming growth factor) and other bioactive protein that helps in wound healing and hair growth. Many studies have suggested that PRP is an effective and safe treatment for hair loss in men and women. People who are suffering from hair thinning are good candidates for PRP therapy. However, to answer this question, there are many professional physicians available in Manchester that can help you to learn more about your candidacy. In PRP doctor takes a small amount of patient’s blood to obtain PRP, the blood is spun in a centrifuge to separate the solid from liquid components. Doctor may apply directly PRP to the scalp with the help of micro-needle or inject small amounts of PRP at multiple locations. The PRP then triggers naturally healing instincts. People who are under some medical diagnosis such as sepsis, chronic skin disease, cancer, acute and chronic infection, systemic and metabolic disorder, platelet dysfunction syndrome, hemodynamic instability, etc are not good candidate for this treatment. Moreover, people with history of heavy drug, smoking or alcohol use should not opt for PRP. PRP is a non-surgical procedure; one can undergo other non-surgical procedure such as DHT blockers and Minoxidil along with this therapy. PRP is a totally natural procedure that has minimal risk of allergic reactions and complications. As hair loss in men is very common in Manchester these days, this therapy work wonders for men who are suffering from male pattern baldness. A lot of women suffer from hair thinning for which PRP therapy is a good option that has no side-effects compared to other methods. Avoid cigarettes, alcohol and medicines like aspirin, Naproxen or any other anti inflammatory medications. Avoid using styling products for 24 hours such as mousse spray, gel, etc. Avoid taking blood thinning and other supplements at least for one week after the procedure. Wear hat to limit the sun for 2 days. Avoid alcohol and smoking and anti inflammatory medications. In London, you can find a full range of hair loss treatment offered by various clinics. 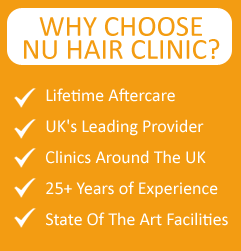 Nu Hair clinic also offer the best hair loss treatments in London. If hair loss is becoming a major issue in your life and affecting your social life as well then you should visit Nu Hair Clinic to get rid of such issues. The clinic offers both surgical as well as non-surgical procedures to anyone regardless of age and gender.